Ironically, Swedish food can sometimes be a bit difficult to find here in Stockholm. The fish-and-potatoes diet that most Swedes' grandparents grew up with is seen as woefully old-fashioned compared to the more popular tapas, Mexican, sushi and Italian cuisines that are found on every street in the city. I think this is a pity as there really are some wonderful traditional dishes here. 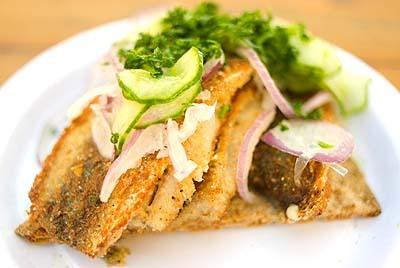 In particular I absolutely love the breads, from the cracker-like knäckebröd to the rye-laden limpor, and am fascinated by the variety of fish dishes; pickled herring, baked salmon, smoked eel, etc. Thus I was fortunate when upon exiting Slussen subway station on Södermalm I came across the stall pictured above that combined the two. 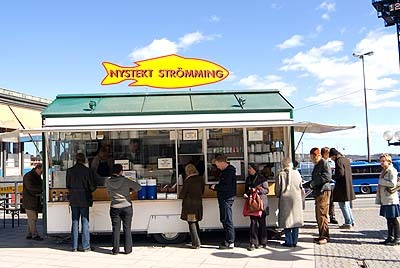 Nystekt strömming means "freshly fried herring", a traditional Swedish dish that at this stall is served both traditionally and with a modern touch. This is the "snack" version and cost 27 kronor, but the herring is also available as a heartier plate along with mashed potatoes and a salad. For those who cannot break themselves away from American-style fast food, there is also a bizarre-sounding "herring burger". According to this site, the owners, Tommy and Viveka, have been selling nystekt strömming at Slussen since 1991. When asked if they ever get tired of fish they replied, "No. If you work here you eat herring every day." Sounds good to me.